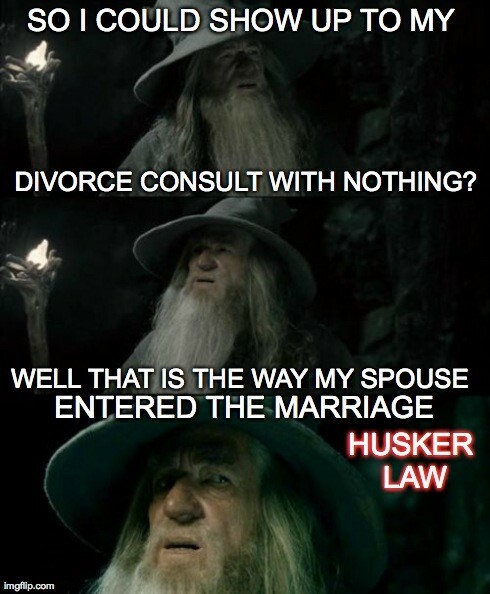 Our firm will meet with you for a free initial divorce consultation. This consultation can be done in person or over the phone. You do not need to bring anything in order to discuss your case with us; however, the majority of our new clients have done their research and they are confident that we are the firm they want representing them in their divorce. In an effort to be as accommodating as possible and respect our clients’ time, we regularly start working on your case as soon as you have read and signed the retainer. The majority of our clients walk out of their initial consultation with their divorce pleadings in hand. If you have children of the marriage, we will need to know where the children have lived for the past five years, and the names of the people they have lived with. Having said that, you could bring all or none of these things to your initial consultation, we can still proceed. We may have to wait until we have all of the inforamtion in order to complete the pleadings, but we can always get started if that is what you would like to do. Aside from the above-listed information, you should readily know the rest of the information we need to draft your pleadings. We will also have you fill out a questionnaire at your appointment. If you would like to fill the questionnaire out ahead of time, click here to be directed to a printable version. Keep in mind that this list is just a list of information that needs to be provided at the onset of your case. More than likely more information will needed to be provided at a later date such as tax returns, pay stubs, VINs and auto lenders for your vehicles and other details about your debts and assets. Further, if your case becomes contested, there could be a whole myriad of documents and information that you will need to provide. Nonetheless, this will give you a good start on the process and we will let you know exactly what other information you will need to provide. To learn more about the divorce process in Nebraska, read Basic Divorce Procedure in Nebraska, Part 1.